The histories of art and religion are intertwined, especially due to the patronage of painters, sculptors, and other creatives by the Roman Catholic Church (and its adherents) during the medieval and Renaissance eras. But the ramification of those periods span into the modern day, for without Leonardo Da Vinci‘s powerfully painted The Last Supper (1498) would Andy Warhol have created nearly 100 variations on that specific theme in 1986 & 1987. Or would Ron English‘s several parodic renditions of the scene exist? Culling inspiration from a diverse breadth of potent religious iconography, modern artists have repeatedly built upon this recognizable imagery, such as how avowed atheist Pablo Picasso subtly interpreted the crucifixion in Guernica (1937). 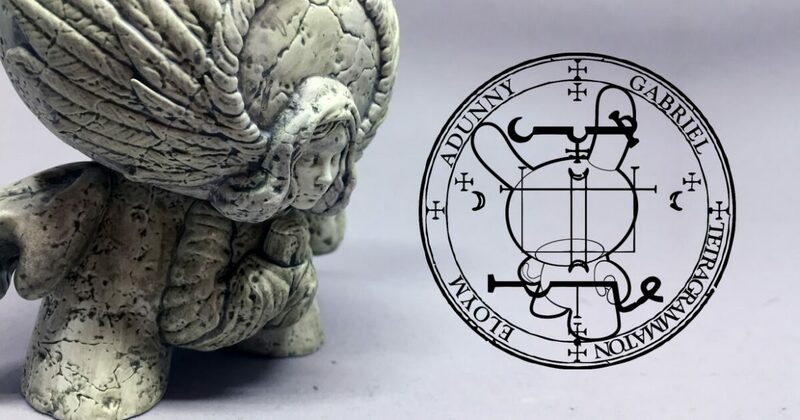 And, more overtly, how Jesse Yu under his J★RYU alias incorporated an archangel’s appearance onto his Gabriel Dunny edition (2019) from Kidrobot, which is the newest addition to the Arcane Divination collection that Yu curates. “The idea of wanting to know one’s future before actually having lived it”, Yu explains, “has always been a perennial question of humankind”, a concept at the core of the initial Arcane Divination offerings. With these works “all based around [the] tarot and the notion of divination and clairvoyance”, Yu clarifies, this collection debuted with the artist’s own The Clairvoyant Dunny (2017), “a singular manifestation of the prophet/fortune teller”. Quickly followed by the issuing of a multi-artist series, these Arcane Divination incarnations depicted “rituals and tools often used to try and understand one’s future [as] applied to the Dunny form”, states Yu. For the forthcoming issuing of Arcane Divination: The Lost Cards, a thematic continuation of the original multi-artist series, “Kidrobot opted to go for two accompanying Dunny five-inch designs in lieu of a new eight-inch design, so I asked Jon-Paul Kaiser if he were interested in collaborating on a pair of Dunnys that would fit thematically into the world of Arcane Divination“, Yu recounts. “Identifying a concept that worked and fit well within the world of Arcane Divination came quite quickly”, he continues, “resulting in the idea of a demon and angel”. And while this may seem a significant deviation from the collection’s previous manifestations, Yu explains that the “ideas of prophecy and fate coupled with religious beliefs have somewhat of [a] connective tissue in that humans place their faith and trust in the unknown, whether [it] be a higher power or destiny”. And while the artists’ divine envoy renditions stem from “different sides of the moral spectrum”, they are “not necessarily absolute opposites”, according to Kaiser’s interpretation. “The angel and demon are still clearly aesthetically and morally opposed”, Kaiser clarifies, though he notes “that there are similarities: worship, duties, and faith define aspects of both characters”. With Kaiser’s contribution to this direction being last year’s Azazel Dunny (learn more here), Yu’s mirrored opposite manifested as the Gabriel Dunny sculptural edition. With only tenuous amount of established dogma connecting Azazel and Gabriel, “the decision to choose Gabriel as the angel represented was deliberate”, according to Yu, who wanted “the best representation of an angel that fit what I wanted to convey through the Dunny“. Referenced “in multiple religions, including Christianity and Islam”, Yu continues, Gabriel “is widely accepted to be an archangel, one of the higher ranking soldiers in the fight between good and evil”. Perhaps of greater importance was “the name recognition, in general, for those who practice religion and those who don’t”, the artist adds, further noting how “Gabriel is the patron saint of messaging and communication, and watches over those who wish to convey their ideas and thoughts clearly, like artists and writers”. Similar to Kaiser’s Azazel Dunny, Yu’s Gabriel Dunny is being issued in a 1000 piece Kintsugi edition, which mimics the appearance of pottery repaired through the Japanese tradition of the same name. Created through “a new coloring technique, which involves a water transfer dip to achieve a more convincing marble-like deco”, Yu explains, adding how the similar colorations “cement the pieces’ relationship to each other in a visual manner”. Beyond this, there was a “mirroring [that] represents both the good/evil, moral/immoral nature of each” design, according to Kaiser. “From the start, we wanted a complimentary pose for the two figures”, Kaiser continues, “as well as [similar] placement of the sculpted parts”, most notably the large wing spreads that overtake the rabbit-like ears on both of these Dunny designs. And “having both designs mirror each other so closely was a subtle way of inferring that one could not exist without the other”, Yu adds, “like markers on opposite ends of the same spectrum”. Emphasized through the two design’s shared kintsugi-inspired colorations, Yu’s Gabriel Dunny also forges its own identity with a Kidrobot exclusive faux Stone edition of 350 pieces. Finished with “a nice wash to bring out all of the sculpted detail”, Yu describes this coloration as appearing “like a treasured artifact from hundreds of years ago”. Covered with cracked textures and weathered exposures, this color scheme especially draws forth the sigil’s detailing on the backside of the work’s head, an aspect on Arcane Divination pieces that “was first established with The Clairvoyant design”, according to Yu. “Since demons and angels have sigils and seals commonly associated with them”, the artist continues, “both Jon-Paul Kaiser and I included them on the back of our designs’ heads”. But for the Gabriel Dunny‘s sigil, “I did modify one of the words that are commonly found incorporated into the design”, Yu reveals, elaborating that “‘ADONAY’ (or ‘ADONAI’) traditionally means ‘My Lords’ but I couldn’t resist the temptation to change it to ‘ADUNNY’ as a playful nod to the legion of Dunny collecting faithful”. And this sense of reverence for the form is shared by Yu and Kaiser, especially in how their sculptural reimaginings were thoughtfully crafted “to keep the silhouette of the Dunny intact”, expresses Yu. “Part of my maturation as an artist”, he continues, “was the ever-increasing desire to try and maintain the original form or profile as much as possible. When presented with opportunities to do a new interpretation of a Dunny“, Yu proclaims, “I make sure that key elements are present to ensure that it best honors the design that Tristan [Eaton] created years ago”. Click Here to Acquire J★RYU’s 5″ Arcane Divination: Gabriel Dunny from Kidrobot, or Click Here to Find a Kidrobot Retailer to Order it from.